The new By Marc Buxton line from perfumer Mark Buxton debuted last year with seven fragrances. Seven strikes me as excessive given the glut of product on the market at the moment — why not two or three really wonderful scents, with more to follow later? Everyone in the industry seems to agree there are too many fragrances; nobody seems willing to release fewer fragrances. Ah well, at least it isn't twelve or fifteen, right? The fragrances are meant to disclose "the personality through color code", and on the Mark Buxton website* you can find the fragrance that suits you best by looking at a series of color blocks, then clicking on the color that appeals to you most. I don't know that there is any fool-proof method of selecting suitable fragrances online, but I didn't find this system particularly helpful. Of the seven fragrances, two of them (Black Angel, Sounds & Visions) left me entirely cold. One (Hot Leather) struck me as nice but nothing I needed, and three (English Breakfast, Nameless, Around Midnight) as interesting and worth further exploration, but not so interesting as to warrant further exploration right away — those went into the purgatory basket. That leaves Wood & Absinth, which I liked right away. It's a blend of vetiver and anise notes, so I'd be pretty much expected to like it, but even then, I can't say I'm wild about it. It's a thick vetiver, almost chewy and almost edible, with sweet (and long-lasting) citrus accents and a touch of herbal bitterness grounded by wood (the notes: citrus, orange, clary sage, anise, jasmine, rosewood, wood and vetiver). The anise notes are strongest in the early stages. It's soapy, and as with other soapy vetivers (Guerlain Vetiver, for instance), some days it seems overwhelmingly soapy to me, other days it doesn't. 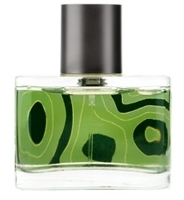 March at Perfume Posse** correctly notes that it has a "weirdly buttery drydown". The whole set is worth a try, although fans of Buxton's brilliant work for Comme des Garçons might be disappointed. Vetiver & Absinth isn't on my "to buy list", but I'd wear it if I had it, and who knows, maybe one of the others will end up capturing my affections. I don't know if the line will be distributed in the US or not; it seems to be geared mostly towards the Russian market. Mark Buxton Wood & Absinth is available in 100 ml Eau de Parfum, 130€. For buying information, see the listing for By Mark Buxton under Perfume Houses. * Assuming you can get the website to do anything at all. It does not seem to work properly in all browsers, and in general, the navigation is not intuitive. If you want to get descriptions of the individual fragrances, don't click on the fragrance names from the front page (that will load — sloooooowly — short videos for each scent). Instead, select "Color Code", pick any color, then click on "Back to Fragrances", where you'll find the fragrance descriptions. **I should note that March didn't like Wood & Absinth, and liked some of the others in the line better than I did. I probably won't spend time looking for this, but for anise+vetiver I'm pretty happy with KenzoAir, which sounds more sheer than you've made this sound. Have you tried KenzoAir? It was one of the great surprises I discovered by ordering a mini last spring, and very full bottle worthy as a refreshing summer splash. I haven't tried it in cool weather yet, but I assume it would be nice and bracing now as well. Thanks for the unintentional reminder! Also have to say I like the look of several of those MB bottles. I haven't — just went on the “get sample” list, thanks! They're nice, although if that's a vinyl sort of label, I doubt I'll like it in person as much as in the picture. Thank you for the review. I wondered about this one (and a couple of others in the line), but I think I might have enough vetivers (don't tell anyone) but what do I know since I rubbed some wax from the Slatkin Firewood (smoky vetiver) candle on my wrists as a solid perfume this weekend. I do love Kenzo Air. It is a perfect all-around scent. It isso sheer like an Ellena re-imagining of Guerlain Vetiver but with more anise and no tomato stem. How have I missed Kenzo Air?!? And did the Slatkin work as a solid? I never have much luck using candle wax. I do like the look of MB's bottles! I'd love to try the English Breakfest! I remember seeing the article introducing these as new scents… and thinking “English breakfast, what do they mean, a fry-up?” The description of the actual scent makes no sense to me, but the name got me thinking of how divine and wonderful bacon and fried eggs and tomatoes and beans and toast are when it's the morning and you are very hungry, but when you finish eating, it all smells greasy and limp and makes you feel a little sick. Just another proof of how enchanting and weird smells can be–they affect your mood but your mood also affects the smell and how you perceive it. Nameless sounds the most appealing to me in terms of what the notes are, and the scene it's supposed to evoke. It's the only one that didn't strike me as pretty silly. The Wood and Absinth also looks like it's worth a try. Now I want Kenzo Air, too! Oh interesting! I'm always suspect of the “I can type you for your perfect fragrance in five easy quesitons” things though. Agree on the way too many scents thing. This is what finally put me off bpal. I love the house, and there are a couple bpal oils that I keep in my collection, but the idea of new LEs coming out monthly, with literally dozens and dozens of new frags a year, just becomes so overwhelming. I missed Kenzo Air too!!!! Will fix ASAP. I don't know how it worked as a solid, but have to say it smelled great in the store. Hey, thanks for the link! Funny neither of us could think of a thing to say about Sounds & Visions. I liked Black Angel way more than you did. The bottles look interesting online but in that way that makes you wonder if they look cheesy in person. Also I upgraded my flash player and still can't get the website to work, although it sounds like I am not missing much. It did. It is a container candle, so the wax is softer than a pillar (maybe soy?). It lasted about 4 hours until a very sweaty yoga class. It is a simple smell not a proper perfume, but a good smell. It is nearly as good as Diptyque Feu de Bois, and much cheaper. I want to smell the Quince and the Black Fig, but they are perpetually out of them. The site is nice looking, but annoying. Note to arty web designers: a website is not a sculpture or an installation. Functionality is crucial. If I can't find info on your website without throwing my mouse across the room, how can I trust your product? Plan accordingly. That one is interesting. Couldn't decide if I liked it or not, but definitely interesting. Maybe we were overcome? Seriously, it's rare that I have such a completely blank reaction to a scent that I can't think of a single word to put in my notes. You are not missing much. The site works for me, but it's just badly done. Yeah. I'd much prefer a duller looking site that actually worked and allowed me to access the information I wanted quickly & efficiently. Please, don't mention the new Hermessence! Please. Oh, my gosh, so true! I got so impatient with the site that is slower than molasses in winter in Vermont I left it, and I have High-Speed! If you can't make it easy for me to negotiate the site, forget it, you most certainly will not get my attention nor my business. That said, I shall now go out and try the Kenzo! That's it. We were verklempt. Like the men in Skarb. Humiecki & Graef should do a fragrance called Verklempt. It's the scent of the tears of perfume bloggers unable to come up with a review. these were on the top of my “to try” list…. but that was too long and I think I'd rather spend my extra money on pad thai, so I threw it out and the only perfumes on my new list are Bandit and Black Rosette. I went to the Website to find my color match, and was flumoxxed. What does “favorite color” mean? I wear neutrals, but I love quinacridone red, bismuth yellow and indanthrene blue but I wouldn't paint a room any of those colors. OK, so this was not meant for a picky artist. Some of the fragrances sound interesting, some of the bottles have great labels, but absinthe and I will never be friends, not as long as it tastes like licorice. And I'm seeing an alarming trend toward anise and licorice scents lately. Yeah, best of luck with that! ROFL — that is a good one! I'd buy it. Pad thai, yes! But you need Bandit & Black Rosette too. LOL — I think you're right, you're overanalyzing. I just picked a few shades that appealed to me and didn't think about why. Still didn't end up w/ a fragrance that was me. There is lots of licorice lately, it's true. Maybe there's some new molecule I don't want to know about. get your bandit ASAP!!! it's the greatest!!!! I think you're right – it went on my list, too. It does seem odd, doesn't it? I didn't like any of the biehl line, really. I mean, ok, but not as great as it should be. Haidee, “English Breakfast” is a particular type of tea blend. I have no idea if it is actually sold or drunk in the UK, but it is quite popular here in the U.S. (apologies if you were kidding). Yeah, but read the fragrance description — doesn't seem to have anything to do w/ the tea at all. I'm getting images of us perfumistas surreptitiously rubbing ourselves with scented candles in shops (try before you buy). And we thought dealing with fragrance SAs was difficult – just wait until you're thrown out of Yankee Candle.